UPDATE 4: Both the descriptions on the US and The description on the JP site has been updated to include a 2100 MHz LTE band, which is what Docomo uses and what AU will introduce by the end of the year. UPDATE 3: Looks like I was indeed correct. Ishiwaka Tsutsumu has an article up on the Nikkei. Skip to page 2 for the important part. Because the only carrier will by SBM, the version on sale in Japan with be non-LTE. A paragraph later, this comes in. It's my understanding that "Softbank 4G" is using Willcom's XGP, which can be relatively easily converted to TD-LTE. Based on the current situation, I don't think SBM can start LTE service anytime soon. 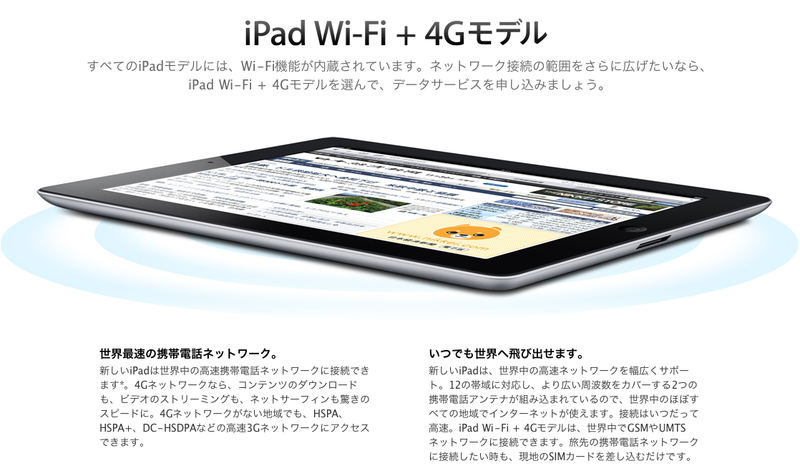 So, it seems that LTE can't be used on the new iPad [in Japan]. 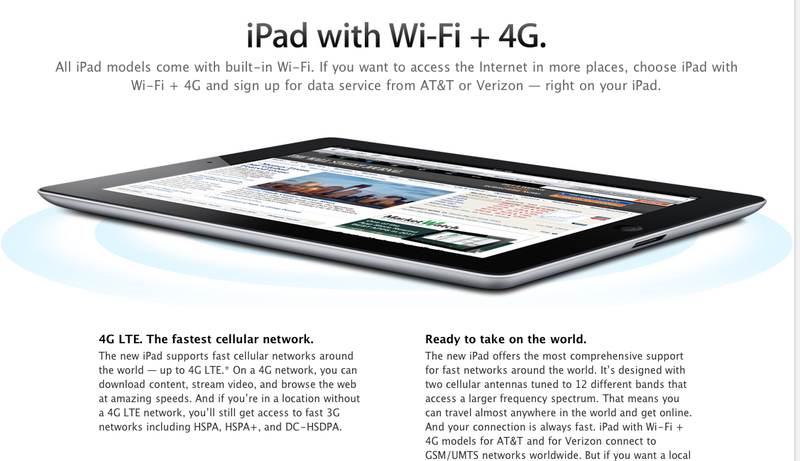 So, if the iPad here will not be 4G, why call it 4G? I really wish people would stopped doing that. Call it what it is, please. It's unclear to me what the progress is on this, though. (Docomo, AU, AT&T, and Verizon are using FDD LTE. The same chipset can (apparently) support both. UPDATE 2: Perhaps in the case of Japan, "4G" is referring to Willcom's XGP that is being converted over to TD-LTE? This post has been updated. When the iPad was first released in Japan, Apple did a poor cut and paste job into the Japanese site that resulted in ambiguities regarding whether or not it was SIM locked to SBM's network. 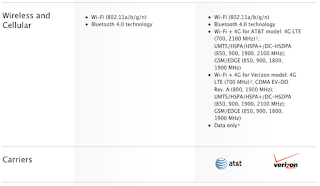 Without seeing specs that specifically say LTE, I would be personally leery of buying it. Remember, there were people who preordered Japanese iPads thinking they were totally "SIM Free" when they weren't. Currently the Japanese JP apple site contains conflicting information. On the one hand, it uses term "4G". On the other, it lists specific protocols and frequencies, none of which are 4G. UMTS, HSPA, HSPA+, and DC-HSDPA are all 3G (or perhaps 3.5G). They certainly are not LTE. (See here for J carrier plans for LTE). Let's also not forget how marketing wonks like to abuse the term 4G. Now, let's contrast this with the US page. The US page also has an expanded description of 4G that specifically mentions LTE. The Japanese site also has an expanded description of "4G" that doesn't specifically mention LTE. It mentions being able to use 3G protocols when 4G isn't available. Now, this would seem to indicate that there is LTE. Without clarification, I'd be hesitant to buy. 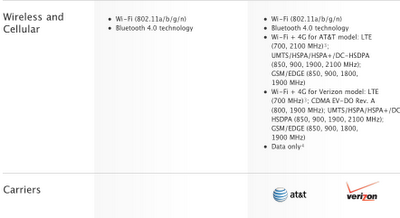 We have several LTE carriers here, but LTE is not listed in the specs on the JP apple site. The only carrier is Softbank. This will work with AT&T 3G network in the US. I don't get the alphabet soup, so I'll ask you: what letters should be there in the UTMS/HSPA/etc. bit for this to be ready to go on, say, Docomo's Xi network? Was literally ready to jump in the car this morning and head over the the AU shop to reserve the new iPad. Have now completely reversed this decision. I won't be buying one unless it appears on another network. In my opinion, an iPad on Softbank is essentially a crippled device, unable to perform a lot of what it is intended for. Especially up here in Hokkaido, Sb is a joke. I've even walked into a Softbank official shop and shown them an iPhone with "no signal". Drive out into the countryside where the GPS/Navi is most useful, and you can't use it because there's no softbank signal to download the on-demand maps. A few months ago I switched to AU when they got the 4S - data is literally between 20-30 times faster than my old Sb phone in the same locations. Very disappointed. Very poor decision Apple. What's the difference between 4G and LTE? The bit you quoted specifically mentions 4G and I thought they were the same. There's a jailbroken app that will do it (caching data), but this was just a single example. Anything involving streaming, or continuous data transmission (Skype, Hulu etc) is just pathetic on Sb in most of Hokkaido. I'd be happy with either a Docomo iPad (which offers the possibility of LTE) or AU, which although still 3G gives a comfortable 1.5 Mbps for me in most places, which is absolutely fine for browsing the web or streaming video. Your location is everything though. Softbank's Tokyo coverage is excellent and I'd choose it over AU. Outside Tokyo and in the countryside, AU beats Softbank easily though. I live in Tokyo and switched from AU to Softbank when they released the HTC Desire HD. AU's coverage in Tokyo was much better than Softbank's and Softbank seems to be getting worse over time and not better (typically losing connection all the time). I hope that the new 900Mhz band will improve things a little. The Register is speculating, like everyone does with Apple products. The only people who know Apple's plans are Apple executives. I'm not confident that Docomo would get a 4G iPad, but for a carrier of their size it wouldn't be outside the realms of possibility if they did decide to add it to their product line up. Personally I'd be happy with a bog standard CDMA KDDI/au version. What I'm most curious about is if I buy a "4g" iPad in Japan, if LTE is not supported here with it, when I move back to America next year, will it be LTE capable there? In other words, does it still have the technology to run on LTE in the states, even if it can't in Japan/other countries? Or is it a stripped down version of the LTE american iPad? 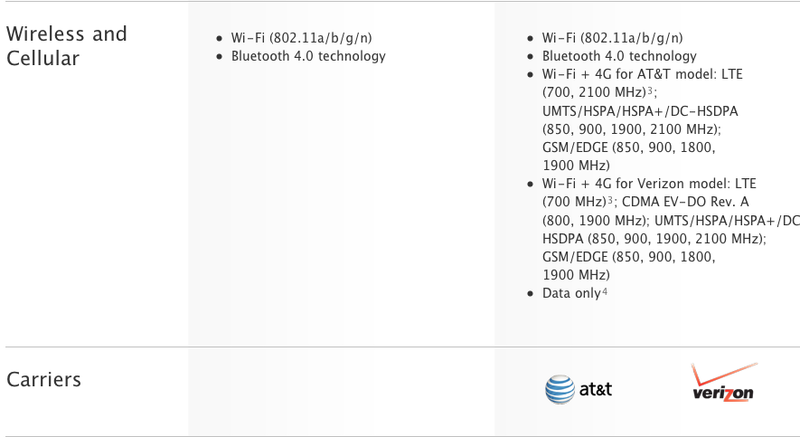 Going to the tech specs of the UK iPad site show LTE in AT&T's band with a footnote that only US and Canada providers will have LTE. So it's a little more than just speculation. See http://www.apple.com/uk/ipad/specs/ In fact of the 9 other non-US launch countries, 8 of them all show this same frequency info. So it seems the AT&T model is the worldwide model, even if it won't actually run on LTE in these other countries. But what is very interesting to me is just 1 of the 9 countries does not have LTE mentioned on the band specs. Japan. See http://www.apple.com/jp/ipad/specs/ So what does this mean???? I asked a question below which was if a "4g" iPad bought in Japan would run on LTE in the states or if it is a special stripped down version. Now that I noticed this spec difference I really wonder. But why make a special version of the iPad just for Japan? Why not have the same worldwide iPad like the other launch countries?? Maybe an accidental omission? Thoughts? As a tourist , if I carry new iPad and use iijmio LTE sim card ( Docomo LTE ) , I guess I will be able to use it . Is it right ? No, probably not. See the more recent post on LTE bands in Japan and compare that to what the iPad (from the US) supports. My guess is that unless Apple has done a better job on the hardware than they have on the launch, both the EU and Japan will force them to remove all mention of 4G from the ads. It doesn't appear it will actually be 4G outside of the US. 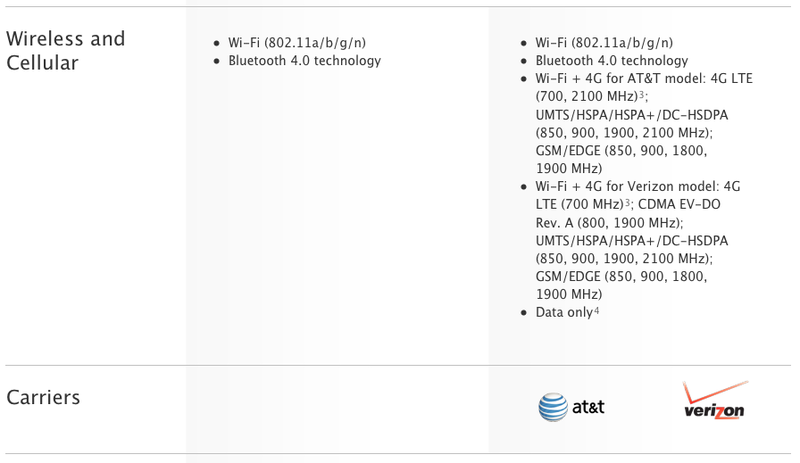 But today, I noticed the .jp spec page now includes LTE on the AT&T bands. I know this doesn't mean it will work on LTE in Japan, but I was concerned buying one here and it not having LTE back home. Seems it will. Actually, both the US and JP sites have been updated to 2100 MHz, which is what DCM uses. This means an unlocked version could be compatible with Xi. Willcom's XGP/Softbank 4G uses 2500 MHz, by the way. Huh? The US site always included 2100...even in your screenshot above. My guess is that it was just an accidental omission on JP side, and that all international iPads are the 700, 2100 one, so they fixed the mistake. Very interesting about the possibility of Xi though. I just called Apple here in the US. They said that 4G LTE is built into the hardware. And the Japanese version doesn't have it in theirs. So when you return to the states no 4G LTE. 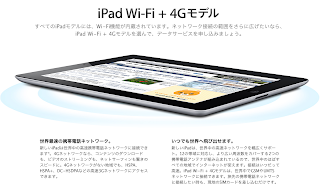 Apple jp is now saying that the iPad has an LTE radio, so I am pretty sure the US staff gave you bad information. It would cost apple more in increased production costs to produce different hardware for different countries.